As part of working through my unfinished craft projects I recently stitched up a little cupcake cross stitch that I bought in the Hobbycraft sale probably about a year ago. 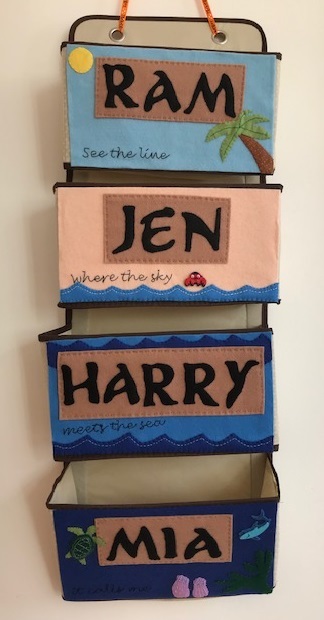 They sell lots of little cross stitch kits, often seasonal ones, usually on 3 for 2, and always displayed in the baskets by the tills so that you spot them while you're waiting to be served and can't help picking them up. Very clever and I've been tempted (and caught!) many times! This little cross stitch only took a couple of hours to do and it's very sweet, but I never really know what to do with these tiny cross stitch pieces when they are finished. I suppose they are designed for cards really, but everyone that I know who would appreciate the work that has gone into a home made card is perfectly capable of making their own lovely cards! So I decided to make a little frame for it using my Cricut Mini so that I can stick it up somewhere and enjoy it. Both pieces are cut from the free cartridges included with the Cricut Mini. For the frame I just used the rectangle shape from Cricut Craft Room Basics. I made a larger rectangle then a smaller square positioned over the top, then a matching back piece. The overlay (cut in pink) is the Emblem Border from the Elegant Cartridge, glued across the bottom of the frame. The cross stitch has been cut to size and secured to the back of the frame with tape, then the second rectangle glued onto the back. It's currently up next to my desk, although I wouldn't be surprised if it finds its way into Mia's room! Thank you! 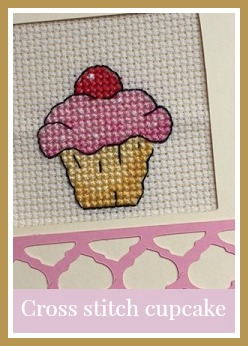 I'm much better at cross stitching than knitting, at least I can easily undo my mistakes when I'm doing cross stitch!